It’s even nicer when you get answers to seeds that have been happening over in the Uncanny storyline. We now know what’s up with Psylocke and why Claremont keeps referring to her bionic eyes–something’s bound to happen there. I’ve all but caught up on the budding romance between Cypher and Psylocke, but I’m hoping there’s more in the New Mutants pages. Psylocke is kidnapped by Mojo and Spiral, whisked off to a neat little place where she is a character in a new animated television series entitled Wildways. Kids around the world are hooked on that whacked-out anime style thirty years ago, just like they are today. Children notably hooked are Rhane, Sunspot and the twin siblings of Karma. No one knows they’ve gone missing (except Captain Britain, searching for Psylocke) until Sunspot dies doing something he should have easily been able to do with his powers. Turns out he’s actually an android, replace for who knows what. Meanwhile, the children that have been kidnapped are turned into beautiful, competent adults, thanks to Mojo. The New Mutants are off to find Sunspot when they are confronted by this new team called the Bratpack, firstly by a guy called Snitch. He’s got a nifty mutant power of setting teammates against themselves, sort of like the Blamethrower weapon featured in the movie Mystery Men. Aside from being turned into adults, Magma doesn’t cooperate and Captain Britain is browbeat into submission, so both characters are turned into children. 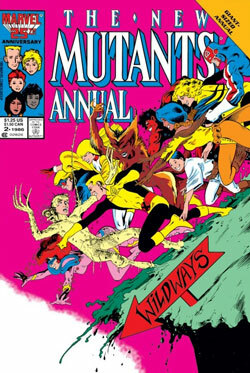 As the rest of the New Mutants are given into adulthood, Cypher and Warlock escape to figure out a way to rescue their friends. The gestalt of Cypher and Warlock is arguably the best sequences of the book, visually and storywise. Cypher comprehending things the way Warlock does is brilliant, not to mention Cypher picking up Warlock’s strange pattern of speaking. Paneling and art here is top notch. All in all a great issue that sets the stage for a few story settings later down the road.